Effective April 1, 2017 the Vermont Wetland Rules will change from the 2010 version to the recently approved 2017 Vermont Wetland Rules. The purpose of this rulemaking is primarily to make minor administrative updates to the Vermont Wetland Rules, last amended in 2010. DEC is issuing this "Procedure for Evaluating Petitions to Adopt, Amend or Repeal Surface Water and Wetland Rules" to provide guidelines for potential petitioners and other persons or entities interested in DEC's surface water and wetlands rulemaking. This procedure is intended to promote clear, transparent and consistent decision-making and assist petitioners and interested entities in submitting petitions during this interim period until the Secretary adopts a Department rule to supplant the NRB's Rules of Procedure. This procedure replaces the interim procedure of the same name signed on January 30, 2013. Wetlands bring visual richness and variety to the landscape. Many wetlands are visually rich environments because of their ecological interest and diversity. Historically, writers, artists, and photographers have been drawn to wetlands trying to capture the beauty on canvas and paper. 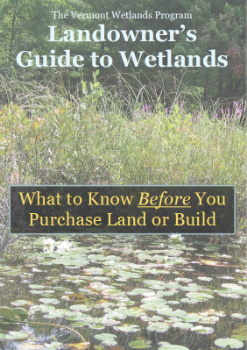 Open wetlands, such as marshes, are often considered to be more attractive than shrub or forested wetlands.